Sure, we’ve seen a plethora of interactive billboards before, but Mark Ecko’s latest eye-catcher could seriously make you miss your ride. 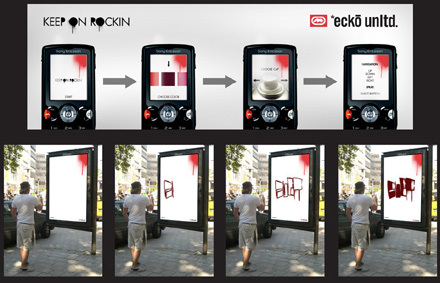 This brilliantly designed ad sports an LCD that can be painted up by your Bluetooth cellphone, as it allows passers to use their mobile as a spray can to decorate the screen as they please. No word on whether this thing accepts multiple connections or not, but a tagging duel would be mighty fine entertainment whilst waiting on the next bus. This entry was posted on Monday, August 1st, 2011 at 4:57 pm	and tagged with ADSpirations, Advertising, art, Billboards, Bluetooth, Bombing, Graffitti, graphic design, inspiration, Marketing and Advertising, Mobile, Outdoor Advertising and posted in ADSpirations. You can follow any responses to this entry through the RSS 2.0 feed.